There is something so beautiful and natural about a wedding (or party!) with a green and white palatte. 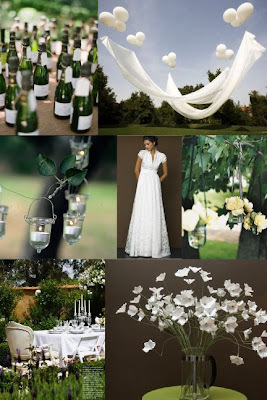 The lush greens provide the perfect balance for the pops of white of the flowers, candles, and of course, the bride! I really really love the floating canopy; it's such a whimsical touch! And if you used this as inspiration for a party rather than a wedding, wouldn't this canopy be fun over a dance floor or buffet? Oh! Or what about flying over the entrance to the party? So many ideas! Enjoy!